A quick LEGO render of Moai using Mecabricks and Blender. Although I posted this on Flickr awhile back, Im getting around to sharing on my blog. I was looking for something quick to render and had this Moai of Rapa Nui from custombrick in my Pinterest. Not thinking twice, I was off to Mecabricks to build the scene. In reality, this is the second version of the model. The first version, which used a minfig leg as the nose, was what I actually started with. After building the model, though, I noticed the second. Deciding I liked it better, I built it and rendered it instead. My first thought was to render the model on its own, but then I did research on Easter Island. Looking at the pictures, I decided it would be more interesting to render a diorama of them. Critiquing my own image, it feels too small. I should have lowered the top right on a bit to allow the fore images to dominate. History teaches us many things. Most importantly, the things that made us who and what we are. In trying to replicate the picture, I raised the camera angle pretty high. I wasnt in the mood to render the rolling hills, so I hid that fact but eliminating the sky. Truth be told, that was a mistake. Adding a bit of blue would have improved the image. But, I needed the Moai to dip below the level of the ground and making the ground flat made that easier. Overall, the scene is fine and, at the high resolution, the models look like real LEGO bricks. 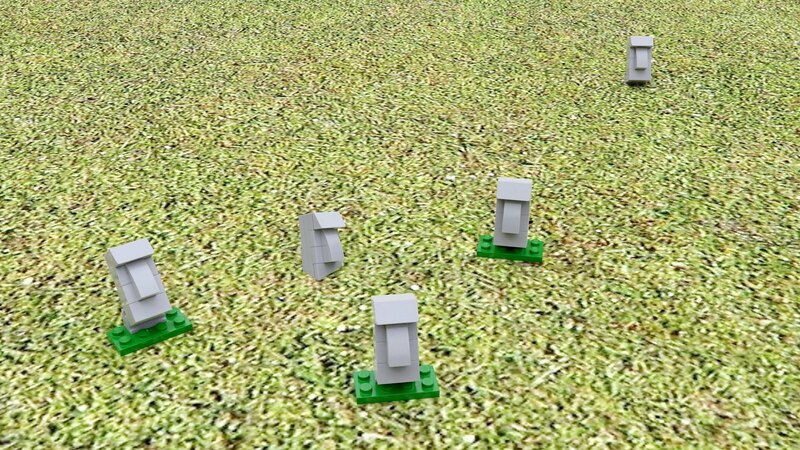 Funny how the grass is the least realistic part, even if rendered from an image. Shrinking the image a bit would have helped. Otherwise, it was a fun render to produce.